Mother's Day is almost here and that usually means a bit of scrambling to find the perfect gift for mom. Luckily, this year, I have an abundance of Mother's Day gift ideas. A few weeks ago, Stefanie and I gathered up a few blogger friends for a Favourite Things Gift Exchange, Mother's Day Edition. It was a fun way to reconnect with one another and treat some of the hardest working women we know. Each blogger put together a package of hand selected gifts and we asked a few of our favorite brands to participate too so I have been feeling incredibly lucky, with mom-approved gifts landing on my doorstep. Here's a look at the awesome gift I received from beautiful Cassie of Hi Sugarplum! Isn't this the happiest and most colourful package ever? It's just as vibrant as Cassie herself. I've been wearing the teal and lilac infinity scarf non-stop. The strawberry biscuits? Devoured. 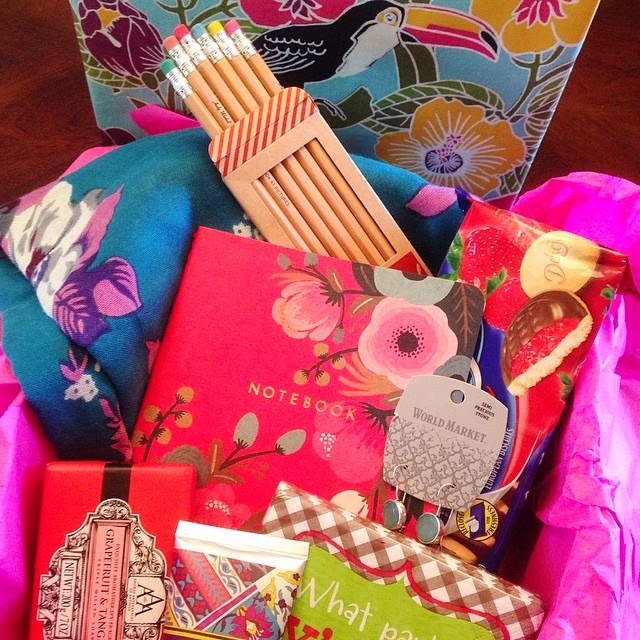 And I don't know how she knew, but I have a fondness for old school pencils and all things Rifle Paper Co. It was the perfect gift and I'm touched by the thought that Cassie put into it. Stefanie has put together a gift guide that contains all the gifts that were given and received. Have a look and click on through for a ton of stylish gift suggestions for mom (I'll take one of everything)! Are you curious what I sent in my package?? Courtney at A Thoughtful Place received these goodies from me. I own each one of these myself and they really are my favourites (though the One Line A Day journal which I've filled with five years of memories might be the most treasured). It has been so much fun getting to know blogger friends just a little bit better. Thanks to them and our sponsors for a making me feel very special this Mother's Day!